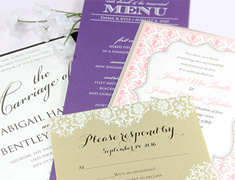 We offer printing on hundreds of premium, top trend cards. Choose from colors white, black, and a rainbow between. 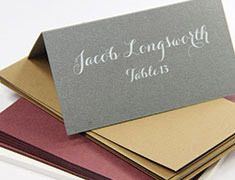 Select from a variety of coated and uncoated finishes - matte, metallic, felt, linen, and more. 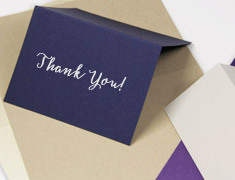 From small 3x5 reply cards, to popular 5x7 invite cards, to large program paper, we offer printing on all popular card sizes to suit your needs. Not seeing your size? No problem. Get in touch with us for a custom quote. To go with all those sizes, all these formats: Flat cards, fold cards, tri-folds...plain, foil border, panel border....and the list goes on. We use high end digital presses and offer flat printing only. This ensures sharp, fast, economical results on orders large and small. 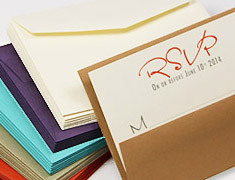 No matter the format, no matter the size, order cards printed on one side, both sides, or with a full bleed. Whatever your design, we've got you covered (pun intended). *Screen color and print color may vary. Physical proof is the most accurate way to determine how your file will reproduce on our equipment & your paper selection. Files to be printed in white need to be submitted in 100% black.